I love warm weather but am not a fan of using my oven when it's hot outside. Since I am always using my crock pot I am always looking for new meal ideas. Tonight's dinner was created by experimenting with ingredients I already had on hand. I knew my husband would love this since he loves anything spicy. As do I! Place chicken in crock pot and sprinkle with pepper seasoning. 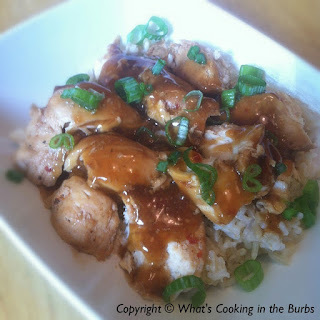 In a small bowl whisk together teriyaki sauce, brown sugar, soy sauce, and lime juice. Pour over chicken. Cover and cook on low 4 hours. Break chicken into pieces and serve over hot cooked rice. Enjoy! Note-If you want a thicker sauce whisk in one tablespoon cornstarch. This looks so good! My husband would love this too! Oh my goodness Bridget. This looks beautiful. I'm adding this to my menu planning. Perfect for mid week dinners. Thanks for linking up to Thriving on Thursdays. I love your recipes.